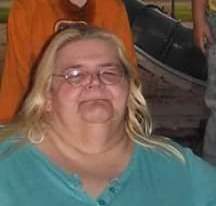 Kimberly Ann Valentine, 55, Montpelier, Indiana and formerly of Rochester, Indiana, passed away at 12:31 A.M. Monday, April 1, 2019 at Lutheran Hospital of Indiana, Fort Wayne, Indiana. She was born on September 16, 1963, in Rochester, Indiana, the daughter of Richard L. and Esther (Quier) Smith. On July 2, 1994, in Rochester, Indiana, she married Terry Valentine and he survives. Kimberly had worked at the former Robertson Transformer and attended the Crossroads Baptist Church, Gilead, Indiana. Survivors include her husband, Terry Valentine, Montpelier, Indiana, sister, Kathy Furnivall , Peru, Indiana, brothers, Karry Smith, Goshen, Indiana, Kevin Smith, Logansport, Indiana, six nieces, five nephews, four great nieces, and nine great nephews. She was preceded in death by her parents and brother, Karl Smith. A Memorial service will be at 1:00 P.M. Friday, April 5, 2019, at the Old Crossroad Baptist Church, Gilead, Indiana with Pastor Thad Stewart officiating. Friends may visit with the family one hour prior to the service at the Church. Burial will be at a later date at Athens Cemetery, Athens, Indiana.